It’s official, I am pretty sure I hate taking pictures of cinnamon rolls more than anything. They just aren’t very photogenic for me… but on the other hand I like to eat them almost more than anything :). Since the gluten-free diet I’ve been on will soon be over, I decided I better get another one of the baking basics posted in a gluten-free version (I also have gluten-free peanut butter cookies, chocolate chip cookies, banana muffins, and flourless chocolate cookies posted and a number of other naturally gluten-free baked goods like macaroons and macarons). While I have many different gluten-free flours on hand I’m starting to think the white rice, potato starch and tapioca flour is my favorite blend (it’s seems to be the one that is closest to all-purpose white flour) so that’s the one I’m using again in this recipe (I’m pretty new at this gluten-free baking thing, so I could be wrong on what is the closest). This batch was my second of the day, the first was also good but it needed some tweaking because #1, the dough was so fragile after rising that half of them began to fall apart when cutting into rolls, and #2, well that was about it :). These cinnamon rolls taste just like the classic gluten-laden cinnamon rolls they just have a slightly different texture than the traditional. 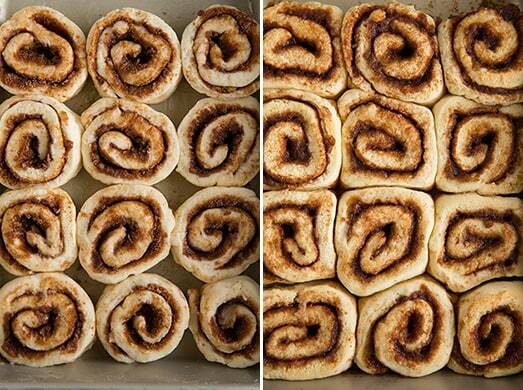 If you’ve ever made the (gluten version) 1 hour cinnamon rolls then these will remind you quite a bit of those. I seriously couldn’t resist these! 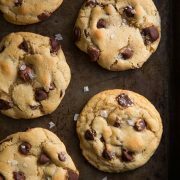 I took them out of the oven and starting eating them without frosting – they were just that good. Of course they only got better with frosting. Each bite just melted away in my mouth. The real test was my husband and kids. They passed with flying colors with my kids and my husband said after one bite “wow! Those are gluten free? Those are one of the best cinnamon rolls I’ve ever had!” Success. Not the fanciest looking cinnamon rolls, but looks don’t matter here. These are amazing! 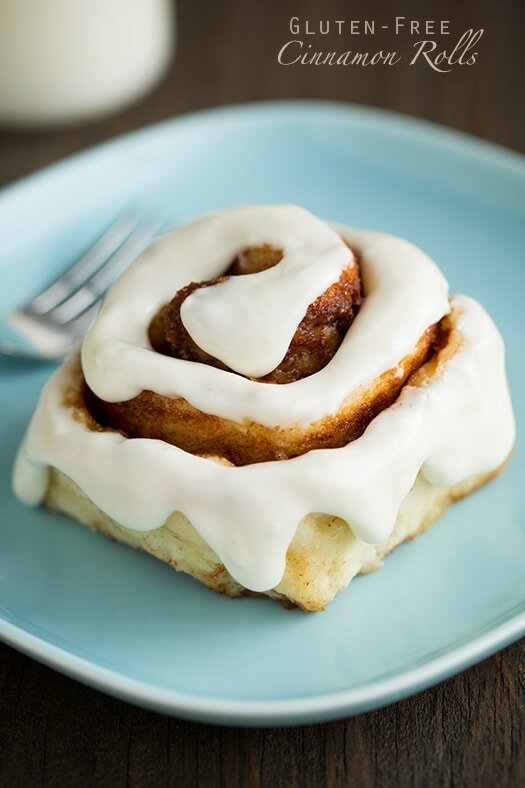 Cinnamon rolls without gluten that are perfectly delicious and ready in 1 hour. Preheat oven to 350 degrees. Butter a 13 by 9-inch baking dish. In the bowl of an electric stand mixer, whisk together yeast, 1/2 tsp of the granulated sugar (from the 1/2 cup) and the water. Let rest 5 minutes. Meanwhile, in a mixing bowl, whisk together rice flour, potato starch, tapioca flour, xanthan gum, baking powder, baking soda and salt for 30 seconds, set aside. To the proofed yeast mixture, add warm milk, the remainder of the 1/2 cup of sugar, 1/4 cup butter, the canola oil and eggs and blend mixture with paddle attachment to combine (mixture will be slightly lumpy but will smooth when dry ing. are added). With mixer set on low speed, slowly add in dry ingredients. Once dry ingredients have been incorporated, increase mixer speed to medium-low and mix 2 minutes. Spread two long sheets of plastic wrap onto countertop one slightly overlapping the other (you will be using it to roll the dough up since it is sticky and rather fragile. You'll need the plastic wrap it to be wide enough so you'll likely have to use two sheets unless you have really wide plastic wrap because it needs to be at least 15 inches wide - for the 13-inch side since you need to leave at least a 1-inch rim on edges for rolling). Dust plastic wrap lightly with rice flour then drop dough mixture onto plastic wrap. Sprinkle top of dough lightly with rice flour then spread two more long sheets of plastic wrap over dough, then roll dough out into a 16 by 13-inch rectangle. For the filling: spread 6 Tbsp partially melted butter over dough, then in a bowl, whisk together brown sugar, granulated sugar, cinnamon and 1/8 tsp salt and sprinkle evenly over melted butter (leaving a small rim uncovered along all edges). Starting on the 16-inch side, roll dough snuggly to opposite side using plastic wrap to lift and roll the dough, and tucking as needed. Press end seam together with fingertips. Cut dough into 12 equal portions (don't saw back and forth with knife, just do one cut downward). Carefully lift rolls to prepared baking dish, aligning them side by side (you'll have a little extra space on one end which is fine, you can either tuck a rolled up piece of greased foil there or just leave it and the rolls on that end will spread a little more). Bake in preheated oven 22 - 25 minutes. Cool slightly then frost with cream cheese icing. Best served day prepared. Store in an airtight container and re-warm individually in microwave 10 - 20 seconds (as they are best served warm). In the bowl of an electric stand mixer (or using a hand mixer), whip together cream cheese and butter until smooth and fluffy. Add powdered sugar, sour cream and vanilla and whip until fluffy, about 2 minutes longer. 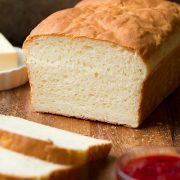 If on a gluten-free diet, be sure to check all of the packaging labels on ingredients to make sure they are gluten-free. 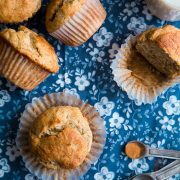 Maria Henderson: My husband grew up with homemade cinnamon rolls for special mornings. I had not impressed him with my attempts until I found your recipe. I have added all the flour blend weights together and substituted Cup4Cup in that amount. 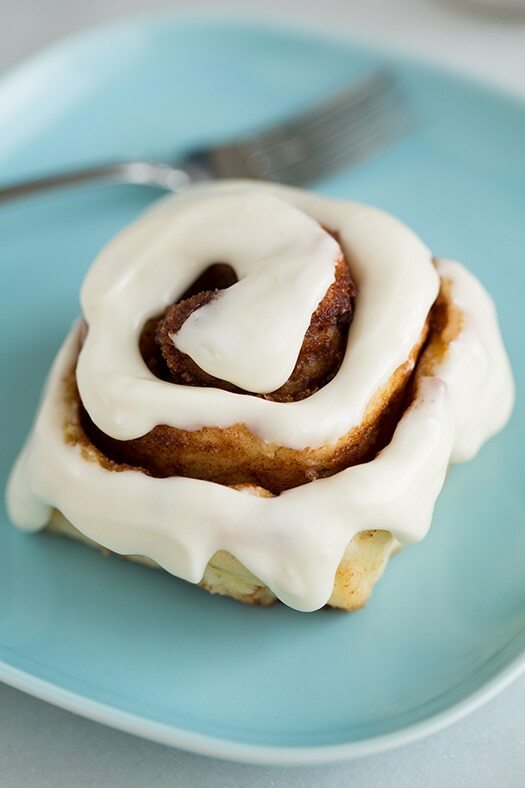 These cinnamon rolls are now a FAVORITE. I must eat gluten free but he doesn’t care. My neighbors are now hoping for a delivery on Christmas morning IF there are leftovers.